Green tea is made from Camelia sinensis plant, which is the same plant used to make other types of tea. It is called “green” because it is made from the very early shoots of the leaves of this plant, before the leaves have begun to oxidize or ferment. While there are generally lesser amounts of caffeine in green tea when compared to black tea, green tea still contains caffeine that can interfere with your sleep. Like any tea, the longer you steep the tea in hot or boiling water, the greater is the content of caffeine in the product. Among types of green tea, different brands can steep over a three minute period of time so the amount of caffeine will be different for the different brands as well. Always look at the tea’s ingredients list to see if they will list the amount of caffeine in one serving of tea. If you really like green tea before bed and can’t do without it, steep it for shorter periods of time. Even if the packages don’t say, you should note that the average amount of caffeine in green tea varies from 10-20 milligrams per gram of dried tea leaves, whereas the caffeine amount found in fermented black tea leaves is about 22-28 milligrams per gram of dried tea leaves. The amount of caffeine in green tea is less than in black tea, on average, but it really depends on the amount of tea you drink, the brand of tea and the length of time you steep the tea. You can cut back on the caffeine by drinking a cup of herbal tea like Chamomile which is naturally caffeine-free and can enhance sleep quality. The caffeine content in green tea varies greatly and can have as much caffeine in it than some black teas, depending on the above variables. Caffeine in general will keep you alert for several hours and can make it very difficult to get to sleep and to sleep soundly. The caffeine content in green tea is approximately the same as is found in many cola drinks, which can also interfere with sleep if consumed right before sleep or in the hours before you go to bed. Another study was done regarding the average content of caffeine in green tea is about 30 milligrams of caffeine per 200 milliliters of tea. This amount is really unacceptable when you may already be suffering from some kind of insomnia problem. Lipton 100 percent green tea lists an amount of caffeine as 35 mg per serving. This is the amount when steeping the tea for 1-2.5 minutes. Longer steeping times can increase the level of caffeine per serving of tea. Green tea contains a large amount of L-theonine, which is a type of amino acid. L-theonine has the capacity to calm you but it also has been shown to increase your level of concentration. Along with caffeine, L-theonine can promote an alert state that mimics the effect of caffeine alone. The consumption of L-theonine in green tea can contribute to its effects on your level of alertness when you are trying to clear your mind and actually get some sleep. Should you drink green tea before bed? As you can see, drinking green tea at night is not such a good idea as the amount of caffeine in each green tea product is generally much too high to be able to enjoy it right before sleeping. It is far better to consume teas that have a known calming and sedative effect, such as lavender tea, chamomile tea, or lemon balm tea. All of these teas have great benefit for those who drink tea before bedtime. Even those teas without much caffeine contain a large amount of liquid in them, from 8-25 ounces, depending on the product you choose. This means that, even if you get to sleep okay after drinking the green tea or green tea product, your full bladder will signal a wakeup call to you some time before it is really time to wake up. Just the diuretic effect of caffeine can lead to excessive urination at night and more difficulty falling asleep once you have taken the time to empty your bladder. As mentioned, there are many good decaffeinated green teas out there so you should consider taking those before bedtime rather than green tea. If you really like green tea and can’t do without it before bedtime, steep it for shorter periods of time or drink a green tea that has been decaffeinated during the processing period. Like coffee and black tea, green tea comes in de-caffeinated packages, perfect for nighttime consumption. 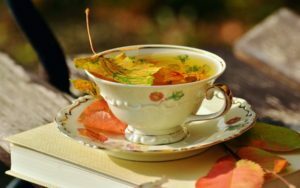 While even decaffeinated tea will contain some residual caffeine -about 2 milligrams of caffeine per cup -it is far better to consume this type of tea as opposed to caffeinated green teas. Here are the best three decaffeinated green tea brands that are available in the market. Green tea has many benefits, so you shouldn’t just avoid it altogether in order to get sleep at night. Drink green tea at least four hours or more before sleeping to make use of its positive effects. For example, green tea has a lot of antioxidants in it, which makes it healthy for the life and health of your cells. Antioxidants can scavenge for oxygen free radicals in the body, which ultimately can destroy cellular structures, including DNA, which can lead to mutant cells that become cancerous. Just because green tea contains caffeine and isn’t all that beneficial when you are suffering from insomnia doesn’t mean you should avoid it altogether. The recommended limit of caffeine intake is 300 to 400 milligrams daily. Green tea has extremely impressive positive qualities that make it a choice beverage. Just choose a decaffeinated green tea or choose one that naturally contains less caffeine. Think of green tea as a better choice for daytime consumption, rather than nighttime consumption. If you drink green tea this way, you will reap the benefits of the tea without it contributing to nocturnal alertness, which can interfere with sleep onset.